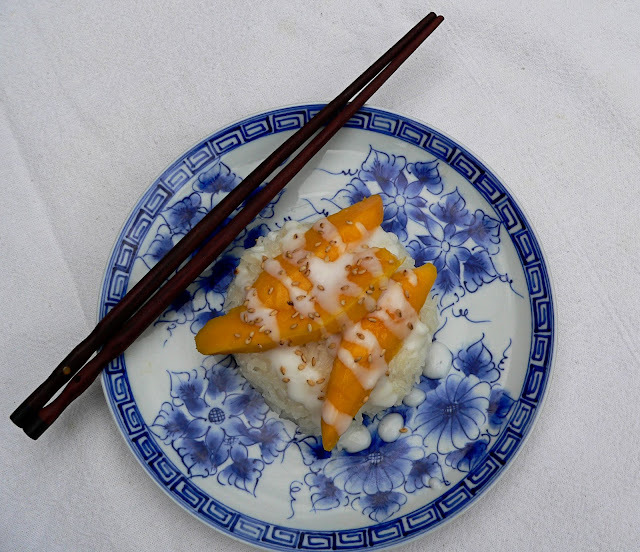 With summertime in full swing there is nothing this woman craves more than Sticky Rice with Mango. It is the ultimate gluten-free dairy-free desert. I could eat it every day. I could eat it all day. Yes, I could eat sticky rice in a house. Yes, I could eat sticky rice with a mouse. I could eat it here and there. I could eat it anywhere. I would, I could eat it in the rain. I would, I could eat it in the dark or on a train or in a car or in a tree. It is so good, so good you see! Don't put it past me to make an entire batch and then stare dumb-foundedly at my family when they come to get theirs and find an empty bowl. This is one of those recipes I knew I needed to learn to make at home after tempting my taste buds at the local Thai restaurant. It is slightly time intensive—but like any good thing—certainly worth the wait. The variety of rice you use in this recipe is imperative to its success. Using the wrong type of rice will not give you true Thai sticky rice. I found the right type of rice at the local Asian market. I could not seem to find it anywhere else. 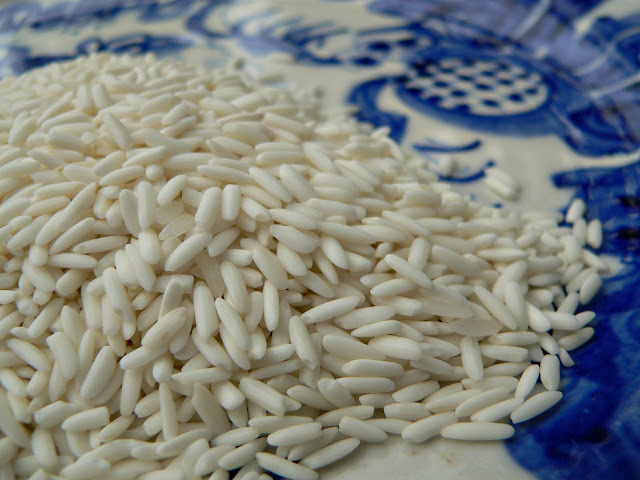 Glutinous sticky rice does not contain gluten, but rather carries the name for its glue-like nature when soaked and steamed. 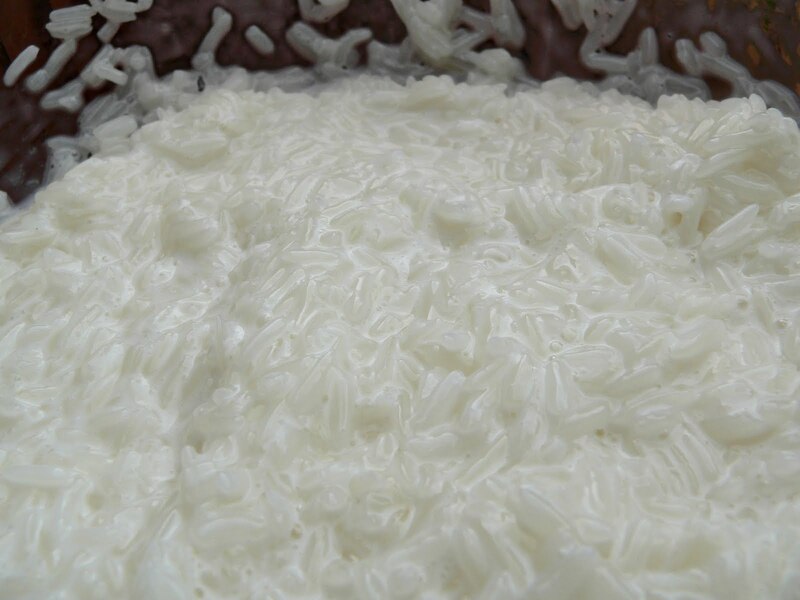 It can also be called sweet rice, waxy rice, obtain rice, biroin chal, mochi rice and pearl rice. 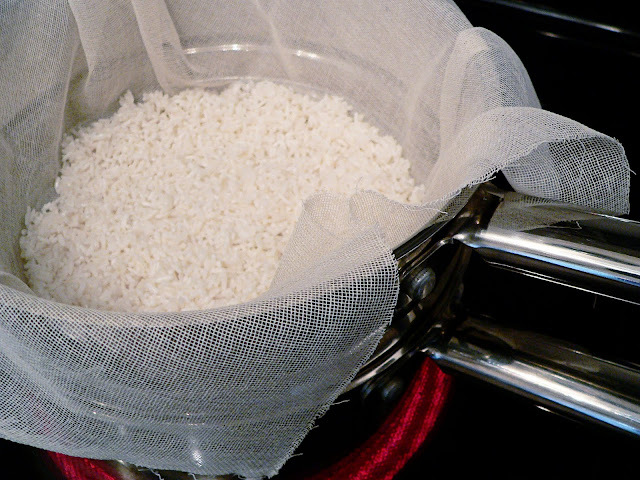 Begin the holy process of making your sticky rice by rinsing and soaking the grains. Rinse them until the water runs clear, or nearly clear. Then place in a small bowl with water covering the grains by an inch or two. Set aside for the next 1 to 8 hours. One hour of soaking will do, but eight hours gives the rice a much stickier quality when steamed. While the rice grains soak, let us take a moment to remember the divine treat that awaits us when the creation process has come to completion. 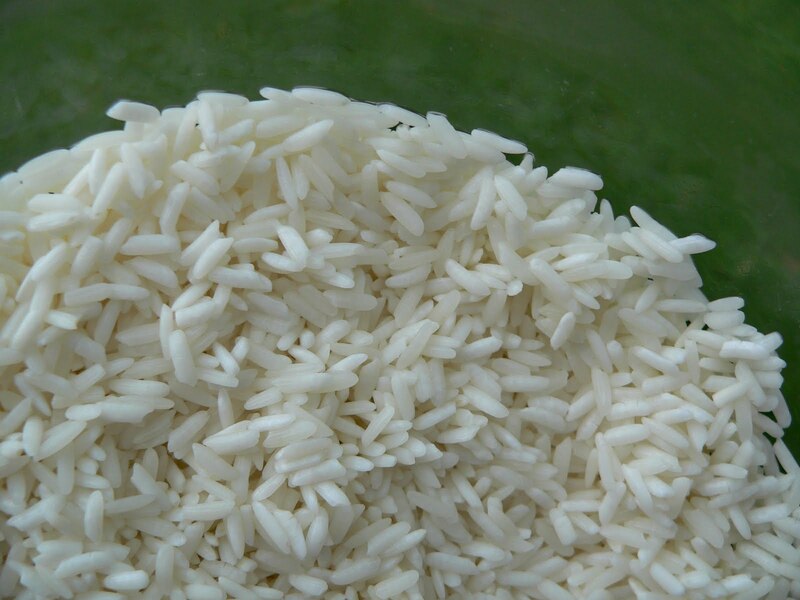 After the designated soaking period, drain the water from the rice. Now set up a rice steaming system on the stovetop. They sell sticky rice steamers at the Asian market. It would be nifty if you had one for this project. But if you don't, simply grab any other steaming mechanism at hand. 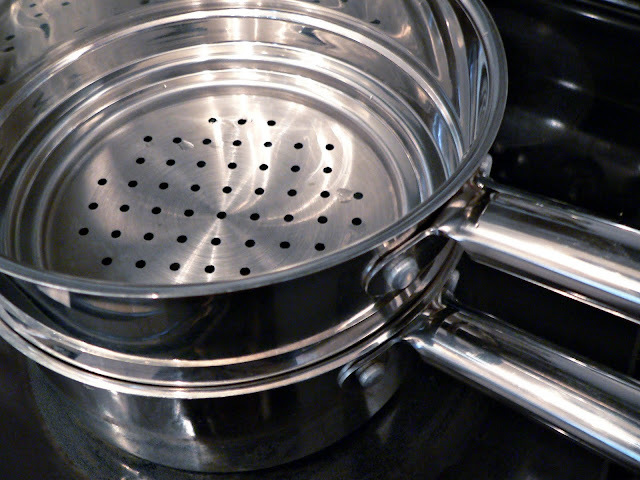 Fill the bottom pot with two inches of water, turn heat to high and wait for it to start boiling. 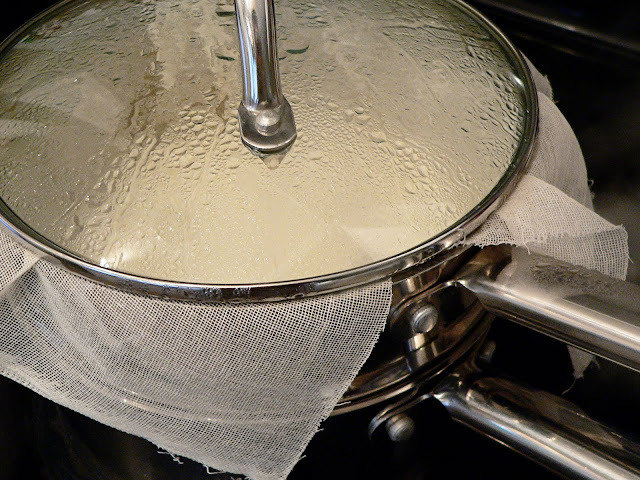 Drape the holed steamer with a thin sheet of cheesecloth and add the soaked rice. Cover with a lid. Keep over medium-high heat for 20 minutes. While the rice is steaming, begin preparing the coconut milk sauces. There will be two distinct sauces. First up, the topping sauce... Sauce #1. 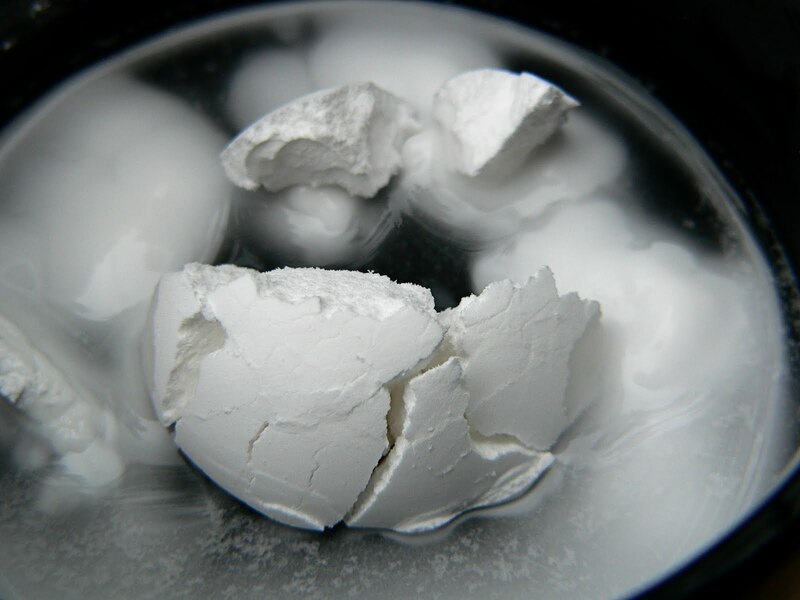 Dissolve 1 teaspoon tapioca starch (also known as tapioca flour) in a trickle of water. 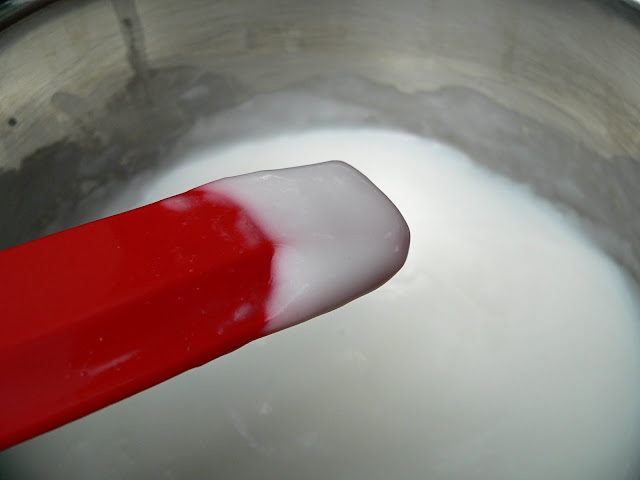 Stir to combine until it is a smooth paste. In a small saucepan mix together 1/2 cup canned coconut milk (remember to shake the can really well), 1/4 teaspoon salt, 3 teaspoons white sugar and the liquified tapioca starch. It will look very thin and runny as seen here on the tip of my spatula. On the stovetop, turn heat to low. Stir. Once thickened, this sauce will turn into a thick drizzle for the sticky rice and mango. Continue stirring until you see it start to thicken up. Do not allow it to boil or simmer. The heat should be kept very low to avoid simmering. You may need to turn the dial on the heat ever so slightly to encourage thickening. This process took me approximately 12 minutes over medium-low heat. Remove from heat and set aside once thickened sufficiently, as seen here on the tip of my spatula. 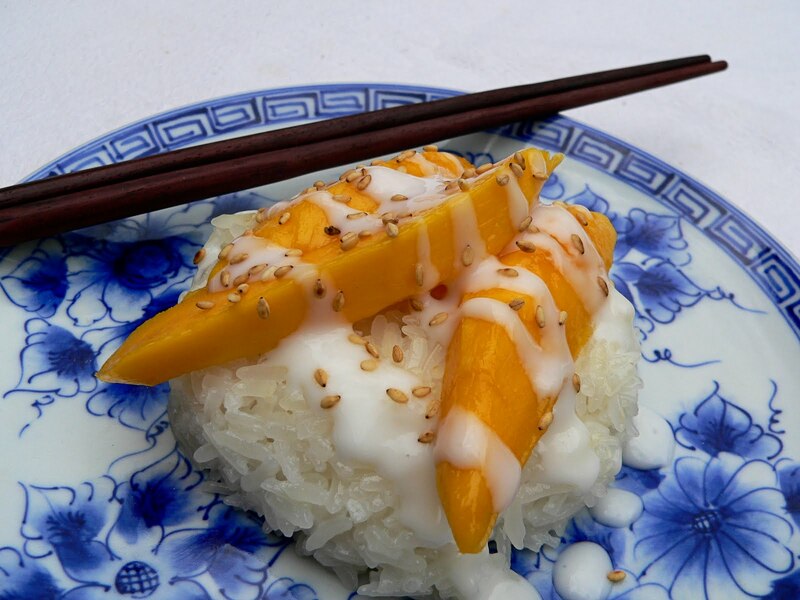 The next sauce we need to prepare is the sticky rice coconut sauce... Sauce #2. I failed to take a picture, so please feel free to use your imagination here. While waiting for Sauce #1 to thicken begin Sauce #2. 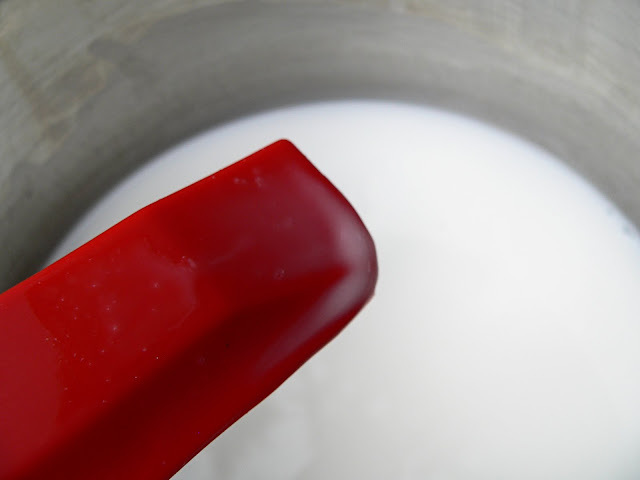 In a small saucepan, combine 1 cup coconut milk, 1/2 teaspoon salt, and 2 TBS + 2 teaspoons white sugar over medium heat. This sauce should not simmer or boil either. Heat just until all ingredients have dissolved. Remove from heat and set aside. 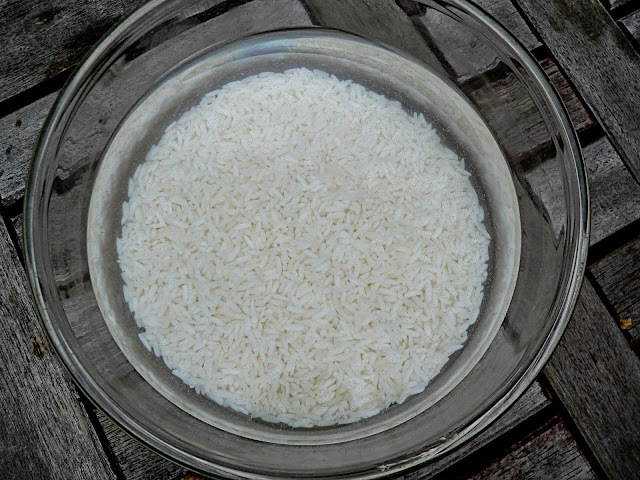 Once the rice is finished steaming, remove from heat and put rice in shallow bowl. Add only 50% of Sauce #2. Stir well to coat each grain in the milky goodness. Keep adding little pours of sauce until the grains are well drenched, but not swimming in pools. Do you know what I mean? The picture speaks louder than my words here. Now set the sticky rice aside covered by a kitchen towel. Wait 20 - 30 minutes while the rice absorbs the coconut milk and becomes even more sticky and luscious than it already is. 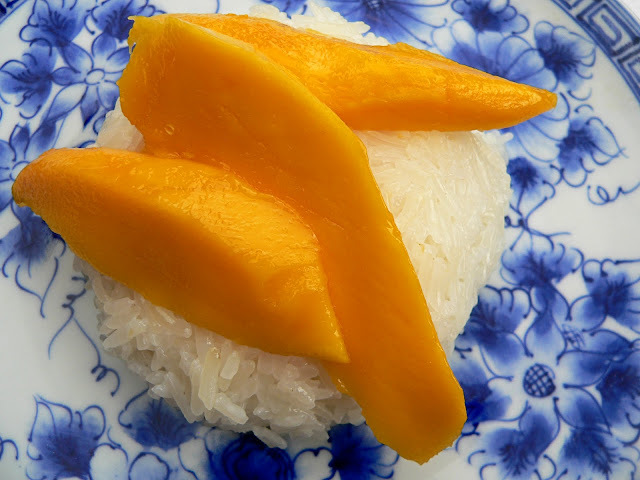 While the rice is gettin' on with its bad self, begin peeling the mangos. 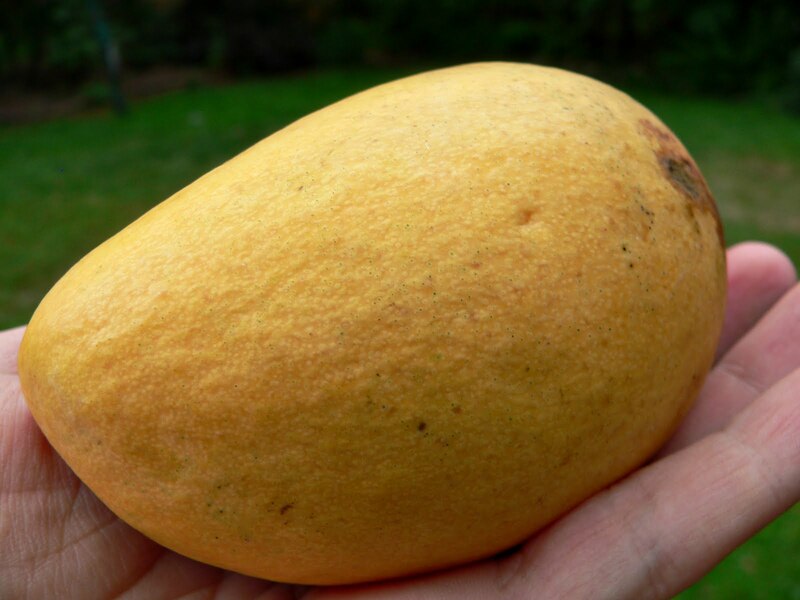 This is a picture of the oblong yellow mango that is perfect and right for Thai sticky rice with mango. Do not use the green and red mangos for this recipe. It just won't be right. The green and red varieties are a bit fibrous and will require you to chew them. 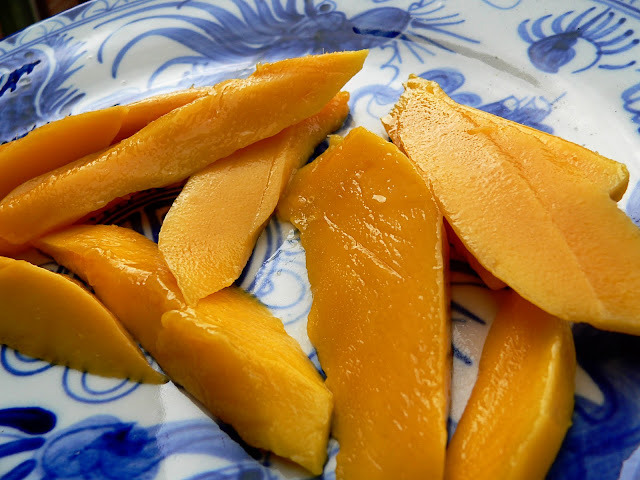 The yellow mangos, on the other hand, will melt in your mouth with each bite. Like buttah. This is how it should be. Again, I say, only use the green and red variety of mango if you are in dire straits. The act of peeling mango makes me feel like I'm on a tropical island near the sea. I like this feeling. A lot. 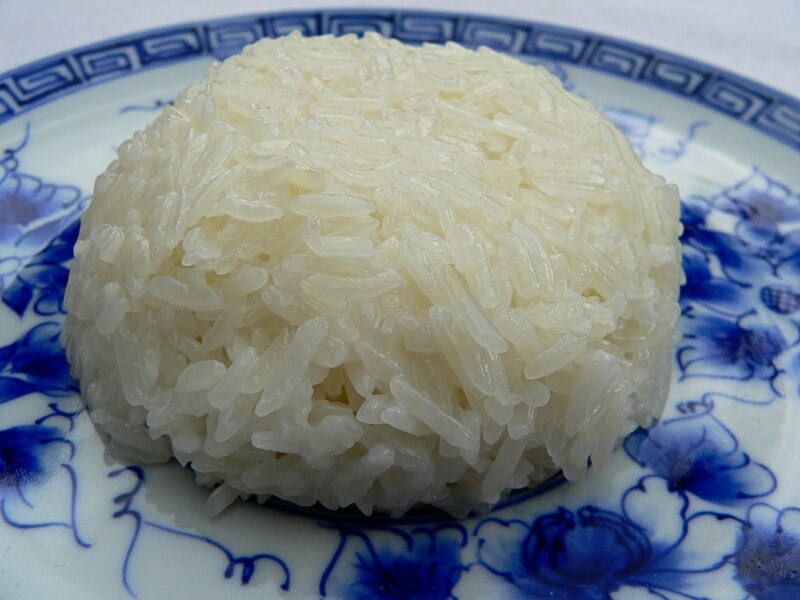 After the rice has sat for 20 - 30 minutes, it is ready to be served. The restaurants always serve their sticky rice in nice compact balls. Use an ice cream scooper, small bowl or Thermos lid (like I did). Pack the rice in nice and tight. Flip over on the serving plate. Top with the freshly sliced mango. Grab Sauce #1 and drizzle over the top. 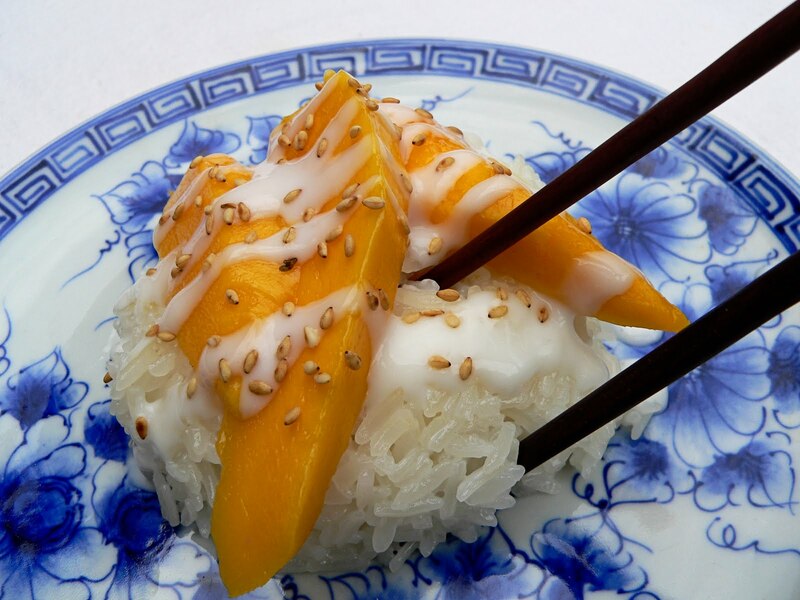 Sprinkle a few toasted white sesame seeds over the desert in all its divinity. 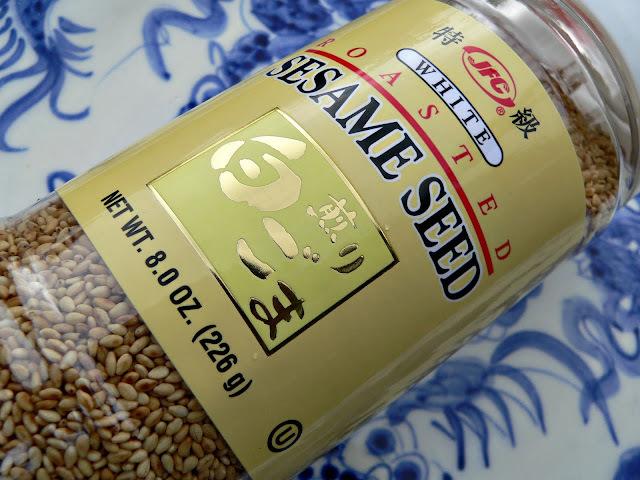 I found these already toasted sesame seeds at the local Asian market as well. Super convenient. Super tasty. The desert just isn't the same without them. Do yourself a favor and make the effort to get ahold of some of these bad boys. And enjoy! Tell me you have not experienced heaven on Earth when you bite into this. Note: The sticky rice and sauces can be prepared many hours in advance of serving. Just don't put the rice in the refrigerator. It will make the rice turn all hard and crunchy. And that's just not right. Simply leave covered on the counter until ready to serve. Crunchy sticky rice is just not right. But Grace Potter is sooo right. Here's one smokin' hot video to jam to while you prep this desert. 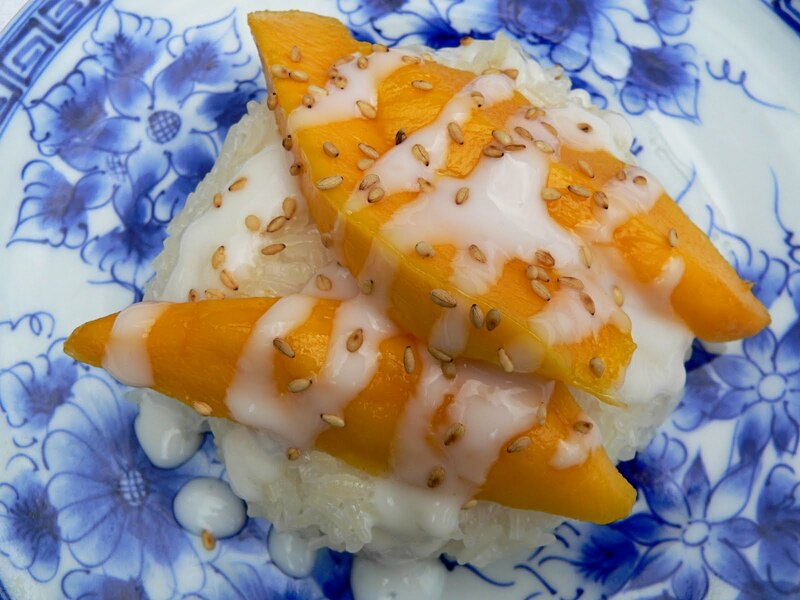 Grace Potter and Thai Sticky Rice—it's like ecstasy in a bowl right here folks. Awesome recipe! I have made this several times over (10-12 x's)and have not yet tied with my fave Thai restaurant's version. I have heard that letting sauce #2 cool off completely (room temp? )will help the absorption. Thank you thank you thank you for posting more details than anyone before! Thanks for the tip about sauce #2. I hope you come close to trumping that Thai restaurant soon! This recipe was very tasty, the first time I tried it it was too soft inside, so I tried this one again and still it was undercooked ... IF I try this one again I'd reduce the liquid or add another half cup of flour.